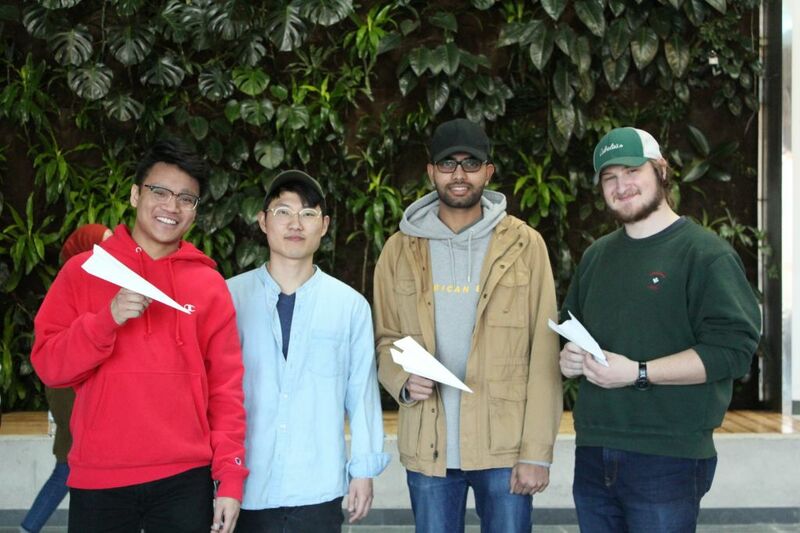 Third-year civil engineering technology students collaborated and encouraged others at the college to have some fun with paper airplanes on March 25 as part of an annual anti-stress exercise. Mark Buenviaje, Mincheol Kim, Jacob Pruner and Eeshwa Hill set up a paper airplane competition to see which paper airplane could go the furthest. While it’s not exactly rocket science, the fun activity had its own benefits. “Even though this event may not have a direct relation to our engineering courses, we are approaching this as to help students take a break from their studies,” Hill said. In their program, students teamed up and set up different activities to experience how to host an event. The paper airplane team experienced the feeling of being in a position of leadership. Students strolled by as they were heading to class or the bus stop, but the 56 who participated took their time to craft an airplane. In order for the participants to win a prize, the objective was to throw the airplane within the boundaries. Just 40 feet away, there was a marked-off box where they could try and land it. “This is the first time that I’ve made a paper airplane. I looked up how to make it but I’m excited to fly it,” civil engineering technology student, Alhasan Masnuss, said. He visited the event to see what was going on and decided to enter the contest for a good time. He took aim and wound up his shot for the target. Some were indecisive about their paper airplane crafting skills but others took interest in the activity. “I thought it was interesting when I saw it. I was planning to pass it but I said, ‘Why not?’” Faith Leroux, said. The culinary student crafted a paper airplane as best as she could. Unfortunately, with two attempts of making it fly, it was unsuccessful. With the event helping students have fun and take a break from their studies, early childhood education student Rukiye Ozdogon joined the event. “It was fun. I didn’t come here for the prizes. This made me happy,” Ozdogon said. Paper airplane competition soar stresses away Reviewed by Camilla Sola on March 29, 2019 .